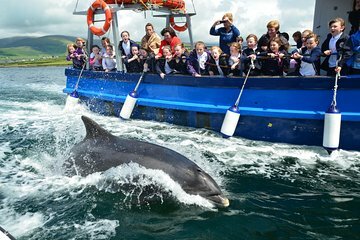 Come face-to-face with dolphins in their natural environment on this thrilling 1-hour cruise around Dingle Bay. Enjoy views of Dingle Harbour, the Connor Pass and Husseys folly as you glide along the coast in search of dolphins and perhaps spot Fungie, Dingle’s friendliest bottlenose dolphin! Best of all: dolphin sightings are so frequent, that you’ll get your money back if you don’t spot one. Guaranteed dolphin sightings or your money back! Just fab will be going again and again. It was quite thrilling to see Fungi the dolphin up close but there was a lot of competition form the other tour boats and some were extremely aggressive. At one point the were 5 different boats chasing this dolphin around the bay and I just felt bad that I was a part of the reason why. The narrator on our boat tour was the best. Only our tour narrator was able to get fungie to go with our boat for quite a distance. I brought my grandchildren and they were thrilled when Fungie swam up and down right next to our boat. This is one of the best tours especially for children. We had a great time, crew were lovely and informative. Thank you for a trip to remember.